Sun Garden Hotel, located along Milagrosa Street inside the Aquino Subdivision in Tarlac City, is a budget-friendly hotel perfect for families and friends seeking quality and affordable lodging and exquisite service. Also an excellent choice for couples seeking romantic getaway, this lovely hotel provides a tranquil vibe and charming atmosphere. The Sun Garden Hotel also has a gym and sports facilities as well as a swimming pool and well landscaped garden perfect for lounging. Big group facilities with modern media equipment are also available for guests seeking venue for hosting various social or business events. Moreover, this hotel also has great service and security measures as it has pleasant personnel and 24-hour security service. In addition, this hotel is approximately 10-minutes away from SM Tarlac where there are various dining and shopping options. NLEX is the easiest way to go to Sun Garden Hotel, you may take a bus since Philippine Rabbit Bus Terminal is nearby the hotel. From Metro Manila take a bus going to Sun Garden Hotel via NLEX and SCTEX which takes 2 hours and a half. 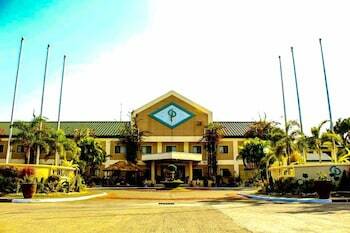 The hotel is located at Milagrosa St. near e-Games Tarlac, there's also a bus terminal nearby the hotel. We decided to stay here on a Wednesday night so our baby can swim in their pool and our baby had fun so it's all worth it. This place is clean. Staffs are very accomodating and respectful. The food is great. Their pool is clean. "Good stay at Sun Garden"
When in Tarlac, we consider Sun Garden hotel as our second home, though there are other good hotels, our first choice is Sun Garden hotel, They never fail to satisfy our need to rest ,be welcomed and served by their friendly staff. Tarlac city is our second home for this is where my grandson's family stay, and the pace we choose to bond with them is Sun Garden hotel. Again, one of my favorites is their well maintained swimming pool where my family could swim and have fun. Once again, kudos to the whole Sun Garden family. God bless.